So... I'm thinking that this is going to be a pretty short post. Mostly because I'm behind on some design work, dead tired, hungry, and grumpy. So... yes, it will be short and sweet. 1. The home inspection went well! There are really only a few minor things that need fixing. DO YOU KNOW WHAT THAT MEANS?!?! In about a month, I will finally have my own space again for the first time in a looonnngggg time. And for the first time ever if we're talking about actually owning a home. So happy. 2. I have a second interview. I guess today's interview went well because I'm meeting with the VP of the department in a week and a half or so. I'm trying not to get my hopes up too high, because I don't want to be disappointed if something doesn't work out. 3. Seeing one of my besties and former roomies for the first time in more than a year. I was a dumb-face and didn't get a pic of us together, but here's an oldie but goodie. 4. Learning more about couponing from my SIL. It sounds dorky, but I am so stoked to be learning more ways to save money!! 5. Having the BEST blog readers ever. 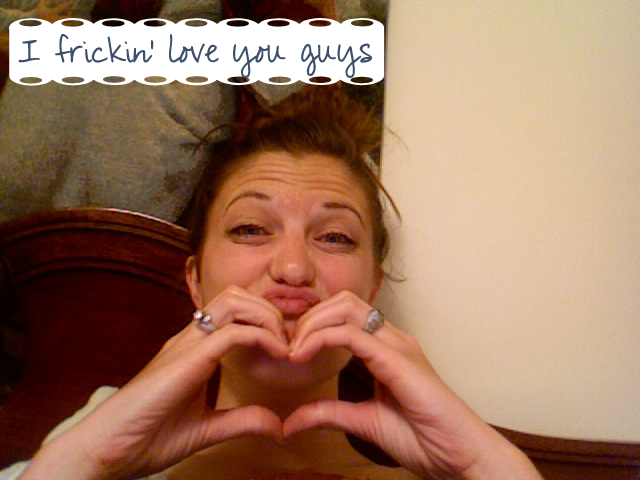 Seriously, you guys - I cannot thank you enough for all of the support and love you give me. I never would have guessed when I started blogging about 9-10 months ago that I would love the community this much. I'm so grateful to have met all of you - you've made the bad days more bearable and the good days and events even better. I love you all. Now I'm done being a sap. And... I decided to do a Q&A vlog session where I answer your ridiculous questions. They don't have to be ridiculous, but ridiculous is fun. So... if you have a silly question, or something that you've just been dying to know, leave it in the comments section (if you wanna ask anonymously, just make yourself anon in the comments section). If you don't want to watch a vlog... don't leave a question. and lets see - if you could go on one dream vacation - where would it be? who would it be with? and how long would you be there? what would you do? oh and if you had an unlimited gift card to one restaurant for the rest of your life - what would you choose? congrats on earning a 2nd interview girl!!!! Yayyyy congratulations on the house and the interview. It sounds like such a great day! Especially catching up with old friends. Yeah! Sounds like you had a good day! Have a great weekend! I always love the pictures you put up. They're hilarious! Glad you are doing well this week, and excited to hear about possibly owning your own home! Sounds like great things are happening in your life. Congrats! What huge blessings! and hanging out with old friends/roomies is so fun... i have a beach trip planned with my two roomies in a few weeks and i cannot wait!! How long did it take you to master the duck lips? Why did you go across the big pond? What's the first thing you want to change about your new house? What time of day do you generally eat cereal? I love everything about this post! Especially your pictures at the top. lol. Congrats on the home inspection and interviews!! congrats on all the good news girl!! my, things are shaping right up! 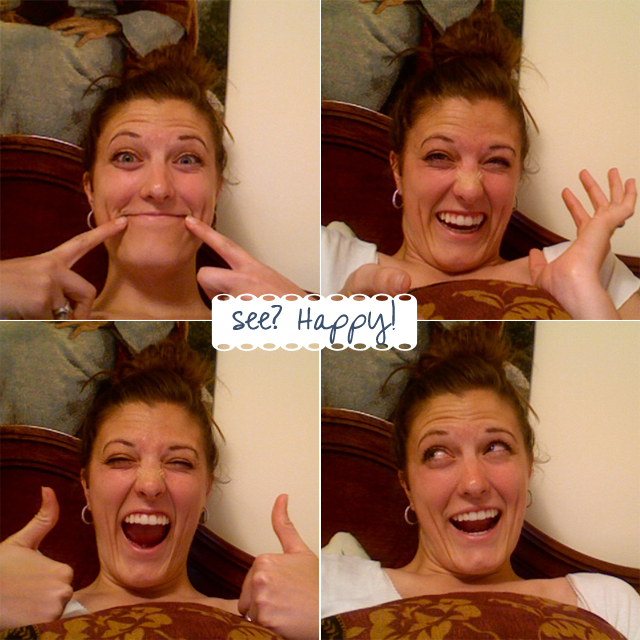 ...can i just say that i love your happy face(s) because i do. and i'd ask, "have you ever got caught, by anyone, doing any sort of physical goodness with your man man? Hahaha! This post made me smile, big time! :o) I'm so excited that you're getting your very own house!!! I can't wait to see pictures of it! And congrats on the second interview. That sounds REALLY good. I'm so glad everything is falling into place! Have a great weekend, sweetie! I am soooo excited for you guys to get this house! And good luck with your second interview. You are going to NAIL it. We all freakin' love you, Alyx! Yay for successful house hunting! :) congrats, Alyx! and a second interview IS promising! What are you interviewing for? Congrats on the house and good luck on round 2! I wonder...what would *you* do for a klondike bar? Do you even like klondike bars?? ...I just had a thought, and I think you'd appreciate....they should make a klondike bar with nuttella under the chocolate shell and peanut butter ice cream. Sorry, pregnant woman here with a major chocolate craving. You are so great for linking up with me! Thanks, Alyx! Congrats on your interview!!!!! Who wouldn't love you?? Made my way over here from Ashley's link up. 1. Love those happy face pictures. 2. Congrats and good luck on your 2nd interview. 3. Hope you have a wonderful weekend! Congrats on a second interview and the house! Lots of exciting stuff going on for you. Nice "meeting" you! I hopped over from Ashley's blog! I have researched couponing but then I get very confused and give up!! Tell us the basics in your vlog. Yeah for all the happy! I like it! :) Let's see... what's your fave thing about being back in America. Least fave thing about being back? Oh, it looks like everything's coming up Milhouse for you guys!! (If that sounded crazy, then you may not be as ridiculous of a Simpson's fan as I am). I can't wait to see some photos of it! yay for good home inspections and seeing old best friends. adorable!!!!!! Hahaha, the tp bubble thing in the last picture makes my day. As does the fact that you took these pictures while you were curled up in bed! You little couponing soon-to-be-an-employed-homeowner diva, you! So happy for you guys that the home inspection went well! You're going to be a home owner!! That means, you're an adult, for real like.